When we think of electric guitar these days, we often think of the icons of your local classic rock radio station or modern hard rock bands. We don't usually think of Charlie Christian, T-Bone Walker or even Les Paul (as a player), though they all had considerable parts in moving the instrument forward. The reason for that is simple: Marshall amplifiers. Marshall amps made it possible to get the sort of stadium-filling, high gain crunch we now associate with rock. Technology always opens up new avenues for art, and the hundred-watt stacks pioneered by Jim Marshall were no different. They created not only a new tonal palette, but an entirely new concert experience. For the first time, people could see a band live with hundreds of thousands of fellow fans and actually hear the band over the crowd. In some cases, the band could now drown out the crowd completely. The legacy of Marshall amps doesn’t rest solely upon the 100-watt Super Lead, though. From the early JTM 45 prototypes to the Bluesbreaker combos and later innovations, Marshall stood for a particular sonic response, a brand of British rock quite separate from the jangly tones of Vox amps. While Fender amps may have blazed a trail for country and early rock ‘n roll, we owe modern lead guitar tone to the precedent-setting Marshall amps of the ‘60s and ‘70s. Below, we're taking a look at the iconic models and events from the company’s birth in 1962 to the end of hand-wired production in 1973. While we do some decoding of various model names in this article, you can get a full breakdown of serial number dating and speaker codes for Marshall amps in our Marshall Dating Guide. Jim Marshall - the “Father Of Loud” and namesake of the company - was not a guitar player. He entered the London music scene as a drummer, first gigging with a local big band and eventually giving lessons out of his house. As his number of students and desire to be a major drum dealer grew, it was clear he was going to have to set up his own shop. Originally named “Jim Marshall & Son,” Jim and his son Terry Marshall opened their doors in July 1960 at 76 Uxbridge Road in Hanwell, England. Eventually the store changed its name to “J & T Marshall” and opened a second location across the street. With soon-to-be-famous musicians like Mitch Mitchell, Pete Townshend, Eric Clapton and John Entwistle frequently stopping in, a community was forming at the store where locals in the midst of a burgeoning rock scene could get away from the big band crowd and talk shop. In addition to drums, Jim and Terry carried Vox and Selmer amps, but the bands stopping by convinced them to import Fender and Gibson guitars and amps as well. The Selmer amps often broke down, so Jim hired a service tech. That person was Ken Bran, a former Pan Am aircraft engineer and musician. When Townshend and Entwistle (among others) started asking for amps that could give more than a Fender Bassman (one of the most powerful amps at the time), Bran was the one who opened up a 5F6A Bassman (on loan from employee Mike Borer) and created a schematic from its guts to use as the basis for an entirely new amp. With the demand for a new sound and the cost of importing amps from elsewhere, Ken was convinced they could and should produce their own. After five prototypes, they had the first Marshall amp - the JTM 45 (JTM for James & Terry Marshall, 45 for the RMS-rated wattage). Contrary to popular belief, it was not merely a Fender Bassman clone. What did they change? Most obviously, all the Fender tubes were replaced with British ones. The 12AX7s became ECC83s, including the input tube for which Fender had used a lower gain 12AY7. The 6L6 power tubes were replaced with 5881s. Other changes included moving the coupling capacitors to the output stage and adding extra negative feedback. These were changes made by both Ken and a recently hired young intern, Dudley Craven. With this new design cemented, Marshall amps went into the store's showroom in 1962. The first few specimens had an offset chassis and control panel (something Jim thought would better line up with the jacks on cabinets), making them rare collectors’ pieces these days. Production ramped up over the course of 1963 with more a standardized centered chassis. At the time, it was said that Marshall had created the "world's first great bad amplifier." Unlike their contemporaries, Marshall amps had distortion coming from the tubes, not the speakers. With that paradigm shift, the stage was set for an entirely new type of music to take root. 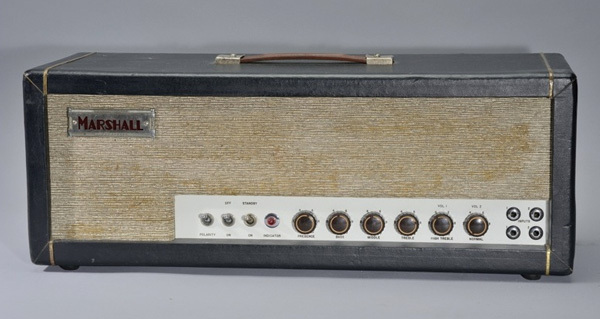 As Ken, Dudley and Jim refined the original amp design, they removed the polarity switch (a holdover from the ground on the Bassman circuit), a move that opened up more room on the now bright white control panel. They decided to use this space for branding, adding the name JTM45 and MKII on either side of the switches. This is the more commonly seen iteration of the JTM 45, as it represents the fully realized and standardized version of Marshall’s first amp. It had two independent channels (Channel 1 had 6 dB more gain than the Channel 2), but it would be fifteen years before Marshall built in channel switching. Both channels used the same GZ34 rectifier tube on their way to dual 5881 power tubes, leading some tinkering guitarists to use a short jumper cable to engage both input channels simultaneously. The low-wattage speakers of the era meant the amp needed at least four of them, giving rise to the first Marshall cabinet design: closed-back with four 20-watt G12-15 Alnico speakers made by London-based Celestion. This stood in contrast to the Jensen speakers found in open-backed Fender Bassman 4x10s and added one final element to the Marshall sound. What was that Marshall sound? Crunchy and bright at full volume. Beefy. Loud. Head-turning and conversation-stopping when dimed. Other amps blew up when pushed that hard, but the new Marshalls seemed to enjoy operating at the limit. Artists began to explore this threshold territory—long before rows of 100 watt stacks—with the humble blues-rock voicing of the JTM 45. 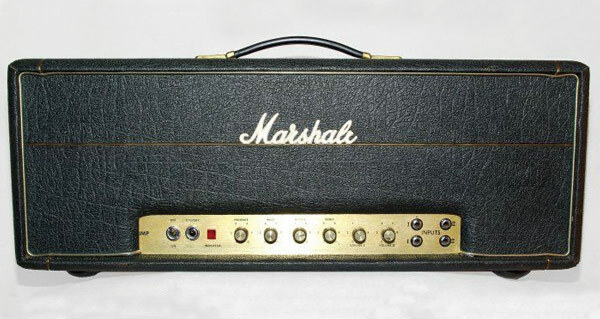 By 1965 the Marshall JTM 45 Mark II was well known in London. Go to any show around town and you’d see plenty of heads and cabinets sporting the metal plate, red block letter Marshall logo. Jimi Hendrix (playing in England in late ‘66), Pete Townshend and John Entwistle were all early adopters. These days, original specimens go for five figures all day long. The first JTM 45 Mark II is even encased in glass at the Marshall headquarters in Bletchley, England. Common lore has it that Clapton asked Marshall to build him a combo that would fit in the boot of his car. While romantic and lionizing, this story is unfortunately not true. Clapton had been touring in Greece with a side gig after leaving the Yardbirds, already having done one stint with Mayall’s band. After the situation in Greece went south, he left for London abruptly, leaving his JTM 45 half stack behind. It was November 1965 when Clapton came back amp-less and poor to start his second stint with the Bluesbreakers. That’s when he purchased the iconic 2x12 combo on credit from Jim’s shop. Marshall combos had been in production for nearly a year at that point, even going through one design change already. Facing competition from the immensely popular Vox AC30, Jim and his team had been developing a combo well before Clapton walked through the door. Origin stories aside, Clapton’s recorded tone on that 1966 album forged a new intersection of blues and rock. His fiery playing was the result of his “Beano” Gibson Les Paul and Dallas Rangemaster pedal feeding into his 2x12 Marshall combo, a sound that defined early Marshall amps as much as the soon-to-be 100 watt stacks. Marshall also made a series of 18-watt combo amps around the same time in 1965. Sometimes referred to as the Bluesbreaker’s little brothers, they used much smaller EL84 power tubes. The 2x10 configuration was known as Model 1958, while the 2x12 was Model 1973 and the 1x12 was Model 1974. (Remember: Marshall model numbers do not indicate year of manufacture.) They all used three ECC83 preamp tubes, two EL84 power tubes, one EZ81 rectifier tube and had optional tremolo and reverb. In 1966, Marshall began building their already respected brand with more powerful amps and several cosmetic changes. More models started to sport the iconic script Marshall logo we now see today, and a new line of 50-watt amps took the market by storm. The new JTM 50 used EL34 power tubes (instead of KT66s, which were harder to come by at the time), yielding a higher output and requiring a bigger output transformer. It also featured a solid state rectifier (common practice nowadays) in place of the old GZ34 tube. These changes led to a brighter, louder sound with a different distortion character. 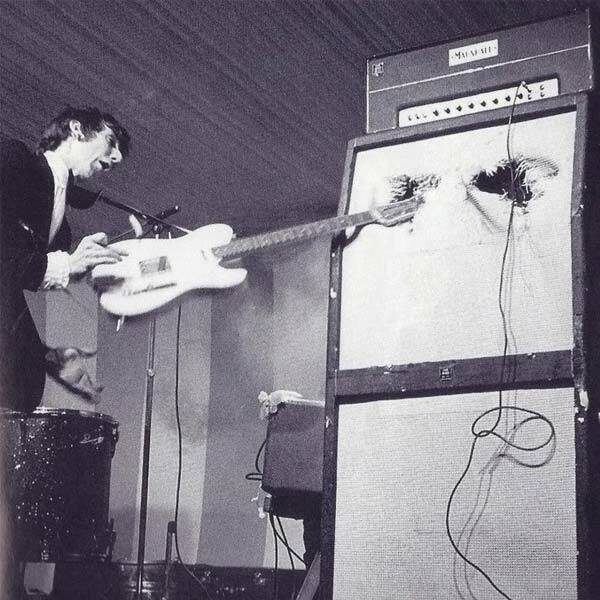 Pete Townshend pierces a Marshall speaker. In search of more power, Pete Townshend let Jim know that 50 watts was not going to be enough. In his words he needed a sonic "weapon," a mandate that led Marshall and his team on a quest to build an unprecedented 100-watt amp. In mid-1965, the first prototypes reached the century mark using four KT66 tubes with two 50-watt transformers (since no 100-watt transformer existed at the time) and a solid state rectifier. These early 100-watt versions of the JTM 45 became the "Dual Output" production model, named for its two separate 50-watt Drake transformers. The front faceplate on these early models still read “JTM-45," but on the back a new white panel read "Super 100 Amplifier," giving rise to the popular name "JTM-45 100." Starting in September 1965, later production models used a single 100 watt transformer. Starting in February 1967, KT66 tubes were swapped out for EL34s. To complement the unprecedented wattage of the new 100-watt head, Townshend asked for a single cabinet with eight 12” speakers. Jim told Pete that such behemoths would be a roadie's nightmare and suggested stacking two 4x12s. Townshend refused, so they initially built six of the cabinets (two for Townshend, two for Entwistle and two went to the Small Faces). They had a tilted top (Jim's idea) and an open back for the top pair. Before too long enough roadies had quit that Pete came back and asked Marshall cut it in half, as a single 8x12” cab proved too unwieldy for his (or anyone’s) road crew. 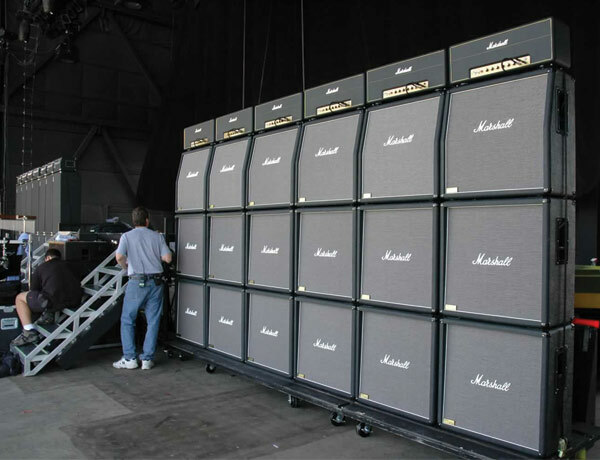 What resulted was the first Marshall stack, with a 100-watt head placed atop two 4x12 cabs. Jim's original suggestion was taken and a legend was born. The word "Plexi" is often used in reference to early Marshall Amps. The term, however, doesn’t officially refer to any one specific Marshall model. It merely refers to the acrylic plastic material (Plexiglas) the company often used for its front and back faceplates from 1965 to 1969. These Plexi faceplates are gold-colored and smooth, not to be confused with the gold brushed metal used from 1969 onwards. If you should buy one (something we heartily recommend if you can pull it off), be careful when removing a Plexi chassis from its wooden case. The front panels chip easily. 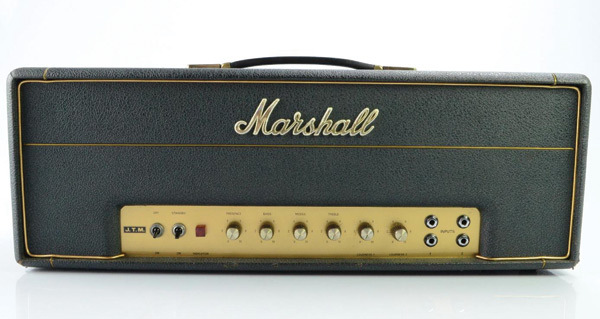 Over the years, the phrase "Marshall Plexi" became most affiliated with the Superlead (model number 1959), an updated 100-watt design introduced in late spring of 1967 that evolved through 1969. The first Super Lead heads used EL34 power tubes (in place of KT66s), dual solid state rectifiers, and a single 100-watt Drake transformer. 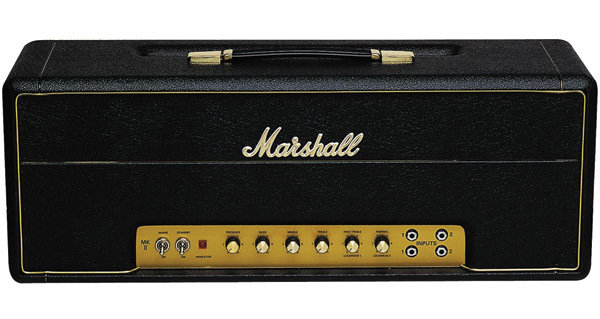 A new 5000pf bright cap was used that, along with the EL34 tubes, gave the Superlead a more aggressive tone compared to the first 100-watt Marshalls. Just months later, Marshall made some changes to the face plate and chassis, using a JTM logo of negative space inside a black “flag” and a steel chassis in place of aluminum. These mid-1967 features characterize what have come to be known as the "Black Flag" or "JTM 100" heads. Most of the other circuitry remained the same, but the steel chassis meant the transformers were placed closer together, creating noise and ghost notes occasionally. Nonetheless, these are still considered desirable amps, largely due to artists like Jimi Hendrix and Eric Johnson using them. In just four years, the 100-watt Marshall head went from a pioneering prototype (1965) to a workable production model with a single output transformer (1966) to a road-tested industry standard with EL34s and dual rectifiers (1967) to a refined legend with a split cathode preamp (1968). Though the logos on the faceplate changed from JTM 45 (1965) to the Black Flag (1967) to the JMP logo (late 1967), these are all considered part of the Plexi family. The model hit its zenith, however, with the changes made in 1968. With the additional of a split cathode preamp for different levels of brightness between channels, a modified tone stack for higher gain and a new Dagnall transformer, these JMP 100 Superleads were louder, more aggressive, more crisp. They made tight and articulate playing possible with loads of distortion. If there ever was a definitive Plexi tone, this was it. 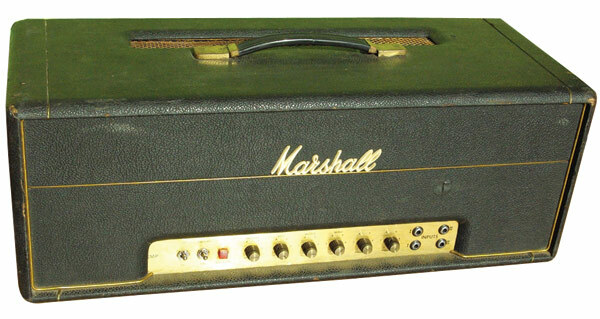 Eddie Van Halen, Jimmy Page, Jimi Hendrix and Eric Johnson all used Marshall heads with the core ‘68 specs. When the last true Plexi heads were made in 1969, a template and a reputation had already been well established. While the new heads moving into the ‘70s would have brushed metal gold faceplates, they still used mostly late Plexi-era internals. With a bit more preamp filtering, updated transformers and self-destruction protection going into the next decade, Marshall amps had hit their stride. 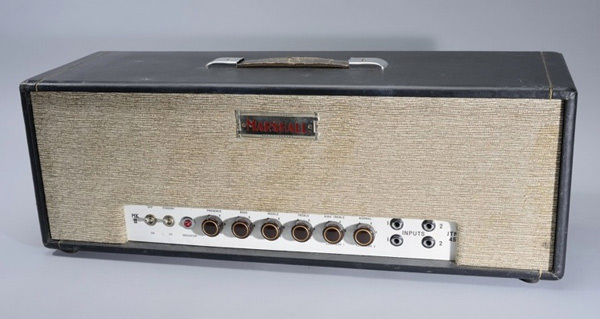 We can’t talk about Marshall history without mentioning the Marshall Major (aka The Pig), a 200-watt version of the Superlead introduced in 1967 for players like Ritchie Blackmore who needed exceptional volume. Keep in mind that in these days players still used their stage amps for all of their volume. If you wanted to be loud, you couldn’t rely on the venue’s PA to magnify your amp. With rock bands hungrily chasing ultimate volume, it was only a matter of time before a 200-watt head came to fruition. Renowned Marshall historian Mike Doyle nicknamed this amp "The Pig" because its "huge cabinet and short, stubby control panel" reminded him of "a pig's snout." These monster amps did not have master volume knobs, just three simple controls: Volume, Bass and Treble. The Major's tube compliment was a trio of ECC83s (12AX7s) in the preamp, plus four Gold Lion KT88 power tubes. They were incredibly loud, but also physically delicate since they operated on the edge of peak performance. 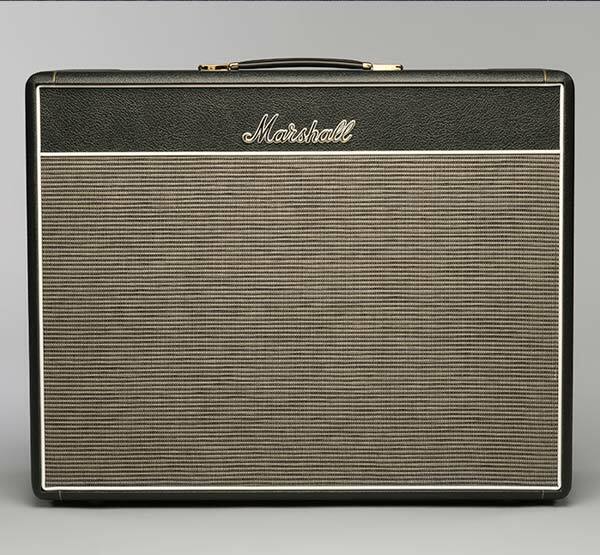 The Marshall Major was discontinued in 1974, after enjoying stage and studio time with the likes of John Entwistle, Mick Ronson and Ritchie Blackmore. In late 1967 Marshall finally retired the JTM model prefix and replaced it with JMP (for James Marshall Products), a name that would stick through 1981. The heads produced under the JMP label from 1968–1972 (‘69 in particular) are considered by many to be the high water mark of vintage Marshall amps. While brushed gold metal faceplates replaced the true Plexi faceplates in mid-1969, the Plexi sound remained the same and became even brighter and louder through the early ‘70s. For those looking for vintage Marshall sound without paying the Plexi premium, specimens from 1970–1973 are great candidates. In 1972 EL34 tubes were getting harder to come by, so the American distributor started replacing them with 6550 tubes. In 1973 Marshall switched to printed circuit boards (no more point-to-point hand wiring), marking the end of an era but not the end of classic Marshall tone. These post-1973 amps are considered less valuable, but whether or not they sound different is debatable. Many thanks to our good friends at Marshall Amplification who were kind enough to fact check this article for us.